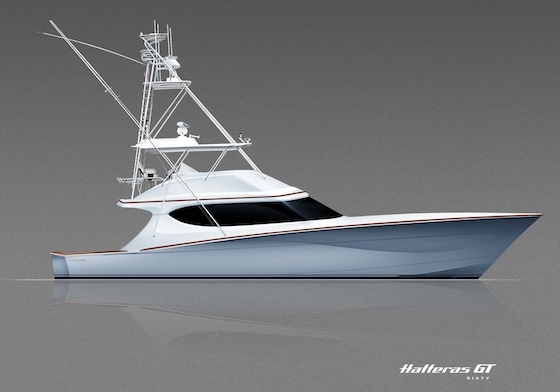 New Hatteras yacht will debut in spring of 2008. Powered by its standard engines, the 56 Motor Yacht is expected to achieve a cruising speed of 18 knots and top end of 21 knots. 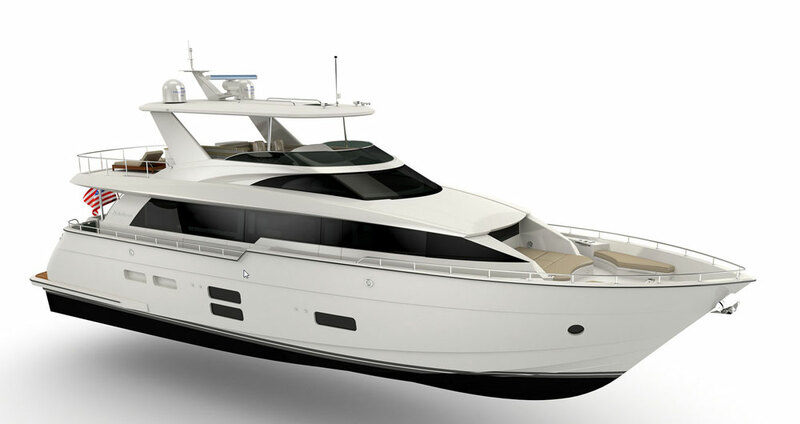 NEW BERN, N.C. — Hatteras Yachts has added a new offering called the 56 Motor Yacht, which is slated for unveiling in early 2008. The 56-footer incorporates original design concepts, a spacious interior and intuitive features that make this an ideal boat for the owner-operator, according to a press release from the builder. Priced at less than $2 million, the 56 Motor Yacht represents a new entry-level product for the thousands of boat owners who aspire to own a Hatteras. 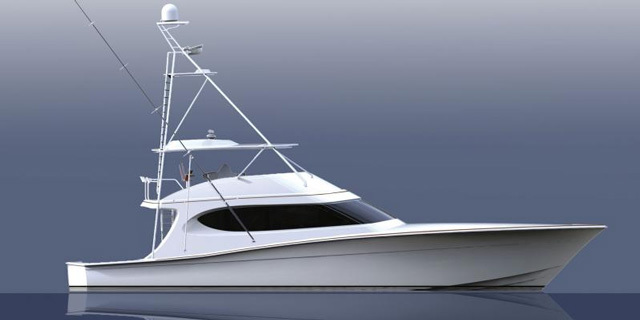 Like all Hatteras models, the 56 features a solid-fiberglass hull bottom that includes beefy support for key areas such as the tunnels, shaft log and strut locations. Divinycell coring is infused into the hull sides, decks and superstructure to add stiffness and reduce weight. And the hull benefits from an advanced variable-deadrise design that utilizes large propeller tunnels to reduce draft and increase efficiency. 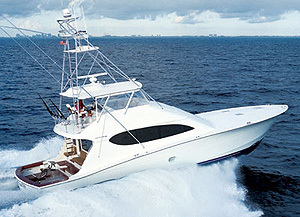 The 56 Motor Yacht features a pair of 705-hp Cummins QSM11s as standard equipment, installed in a V-drive configuration with the gearbox forward. This positions the engine room as far aft as possible and allows for more living space below. 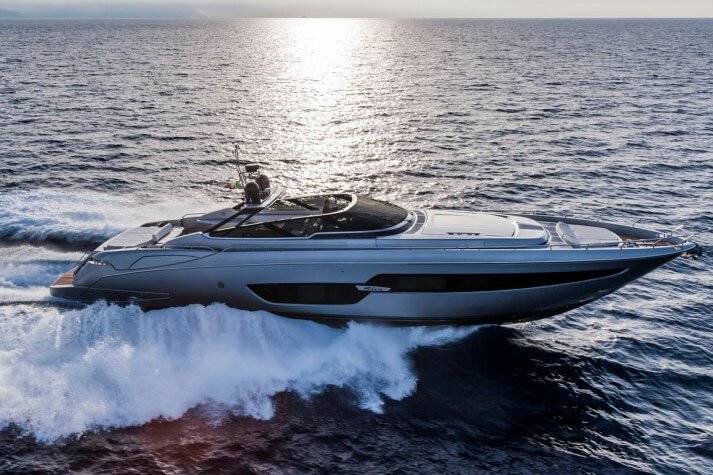 Combined with the boat's 18-foot 2-inch beam, this configuration reportedly gives the 56MY as much interior volume as many yachts in the mid-60-foot range. Powered by its standard engines, the 56 Motor Yacht is expected to achieve a cruising speed of 18 knots and top end of 21 knots. With her 900-gallon fuel capacity, that provides a usable range of approximately 300 nautical miles. Optional 1,000-hp CAT C18s will push the 56 to a cruise of 26 knots and a top end of 29 knots. The 56MY features a three-stateroom, two-head arrangement that includes a 130-square-foot full-beam master stateroom amidship, a VIP stateroom forward, and guest bunks to port. An optional arrangement provides for a private crew quarters with discreet access, in lieu of the third guest stateroom. Entrance to the 56 Motor Yacht is through a three-panel sliding door framed in stainless steel. These panels stack to port to allow for an extra-large opening between the salon and aft deck for easy maneuvering and access to fresh air on that perfect fall morning. The salon features a large sofa to port and smaller settee starboard. A 37-inch, flat-screen television is mounted under the galley countertop for easy viewing, and oversized frameless windows provide a panoramic view when the scenery is entertainment enough. A single step up leads to the galley and country kitchen forward. The U-shaped galley features solid-surface countertops and backsplashes for a long-lasting durability and good looks. An upright refrigerator and freezer provides for expanded cold storage, while a two-burner cooktop, convection/microwave oven and stainless-steel sink make you feel at home while preparing a meal. Custom-designed cabinetry with a rich mahogany finish provides a luxurious feel and plenty of storage for your food, silverware and cookware. To port, a large circular dinette gives the feel of a country kitchen found on larger motoryachts and provides seating for six, situated just forward of the stainless-steel ladder leading to the bridge above. For those who prefer a lower helm in lieu of the country kitchen, one is available as an option. 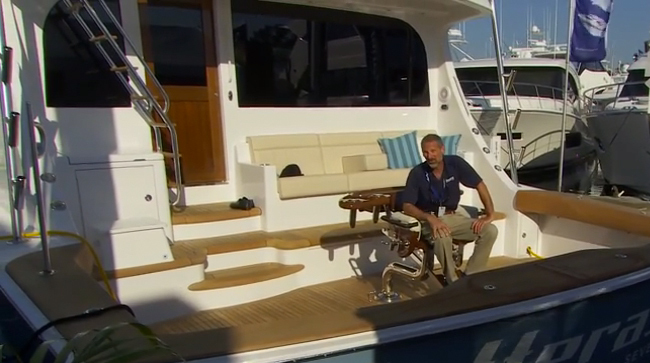 Outside, the 135-square-foot aft deck compares favorably with much larger yachts. A molded circular settee provides comfortable seating for owner and guests, with quick access to steps both port and starboard that lead to the swim platform below. A more contemporary aft deck arrangement is available that provides more usable space, while improving the views aft. This design eliminates the standard fiberglass aft bulkhead and instead uses stainless-steel railing and tempered, laminated glass to encase the aft deck. In addition to its spatial benefits, the optional design will also find favor among Hatteras' European clientele, as it allows for the installation of an optional passerelle and davit that will facilitate Mediterranean-style docking and dingy storage on the swim platform. Side decks measuring almost 13 inches wide allow for easy docking by the owner-operator and provide access to a storage locker to port and a molded-in bench seat on the bow deck. 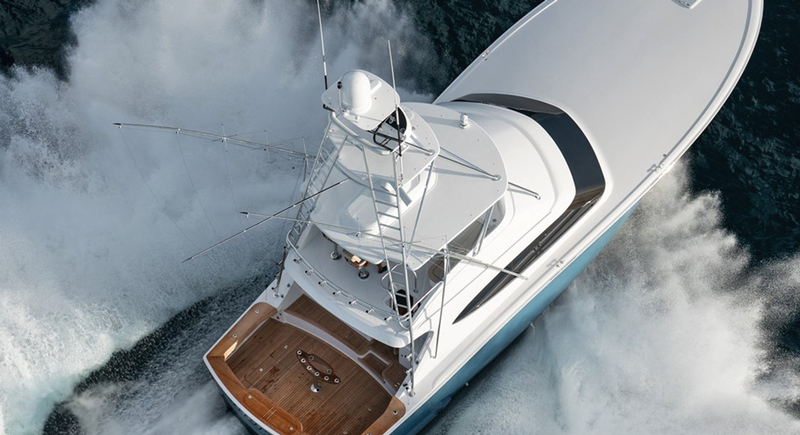 Whether entered through the aft deck hatch or optional bustle door in the transom, the heart of the 56 Motor Yacht can be found in the spacious engine room, where twin diesel engines are configured with a V-drive propulsion system that places gearboxes forward, coupled to shafts set at 10 degrees. This configuration greatly increases the space available for interior accommodations. A single athwartship fuel tank set forward of the engine room bulkhead eliminates the need for a fuel transfer system and helps distribute weight efficiently for improved performance. This fuel tank is located close to the center of buoyancy and keeps trim angle steady as fuel is consumed. Belowdecks, owners will enjoy a full-beam master stateroom with its tapered king-sized berth, vanity to starboard and large fixed portlights. Cedar-lined hanging lockers and twin dressers provide abundant storage for clothes and gear, and the large fuel tank — positioned between insulated bulkheads just behind the master bunk — significantly reduces noise from the engine room so you can better enjoy the 20-inch LCD television and stereo speakers above. To port, a hinged door leads to a private head with twin sinks, solid-surface countertops and owner's choice of either a shower or full-size tub with tempered glass sliding door. 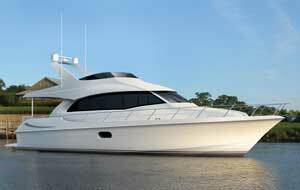 The 56 Motor Yacht features generous living areas in the bow and to port for guests, with a shared head to starboard. A spacious VIP bow stateroom features a tapered queen berth that lifts on pneumatic rams to reveal cedar-lined storage below. A cedar-lined hanging locker and cabinets to port and starboard provide additional storage. To port are twin crisscross bunks perfect for kids or crewmembers. For those who prefer private quarters for their crew, an optional arrangement replaces the port twin bunks with a discreet "Euro-style" crew compartment complete with 6 feet and 6 inches of headroom, single twin bunk, hanging locker, sink and shower. Access to this compartment replaces the portside storage locker on the bow deck above. Despite the luxury and amenities found below, the place to be on the 56MY is clearly the flybridge, where beautiful views, fresh air and comfortable social areas provide the perfect backdrop for any cruise. The standard bridge arrangement features twin helm chairs and a centerline helm with space for multiple flat-screen displays and the electronics required for long-distance cruising. Guests will enjoy spacious seating to port along with exterior access to the aft deck. 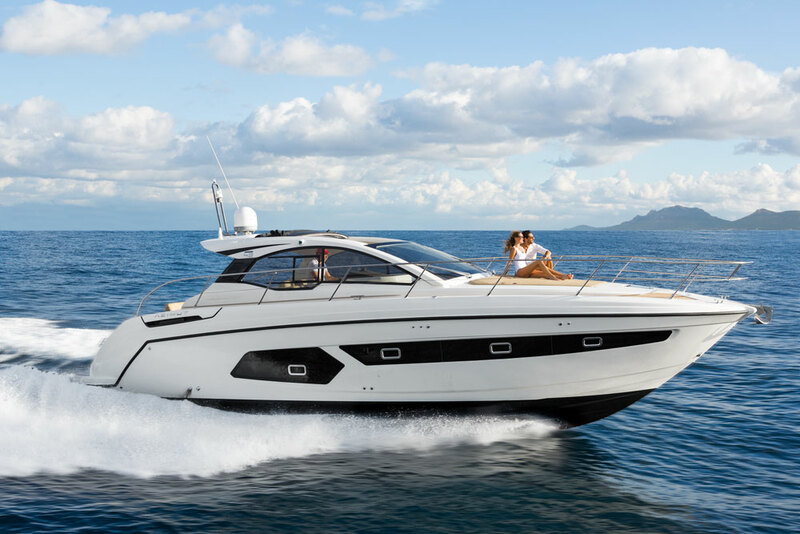 On the aft overhang, you'll find plenty of room for an optional davit and dinghy up to 10 feet long, or you can opt to store your dingy on the transom and enjoy an additional 208 square feet of entertaining space on the bridge that incorporates a sun lounge and additional seating.